Are you looking for best blender under 100 dollars that will not disappoint you? Everyone admits that blender is one of the essential things in the kitchen that versatile. It can be used to make smoothies, protein shakes, healthy soup, puree, ice cream and other types of blended product, just name it. That is why having a robust and durable blender but not too expensive is everyone dreams. No one of you likes to own a cheap blender that will break after months usage. In the market, there are a lot of type blenders, with a price range between around $30-$800. And sure, get the most expensive one probably the best and easiest option when picking a blender. But if you have a limited budget and only want to spend not more than a hundred buck for a blender, then this article will be suitable for you. There are hundreds type of blenders out there which suitable for your budget, but in this article, I will only list 5 popular blenders under $100 those are already proven to give the reward, based on the customer reviews. KitchenAid 5-Speed Classic Blender KitchenAid 600 Comes 5-blending speeds. Manufactured by John Oster Manufacturing Company (Sunbeam Products, Inc.) which has produced electric home appliances since 1910, this blender Oster Pro 1200 has to be among the best budget blenders but still offers an array of remarkable features. It fitted with a powerful 1200-watt motor of ice crushing power and 7-speed blending controls including 3 pre-programmed settings for the most popular blender creations, which include time and function that allow it to break frozen drinks and foods evenly. Another best feature from this blender is the automated dual direction motor also allows the blades to alternate frontward and backward, which enables it to draw food and ice down and create consistent smooth blending. Is there anyone who wouldn’t wish to get fine and delicious smoothie really? Your guess is as right as mine. It fitted with a six-pointed super-sharp blade that chops food and steadily in just a matter of seconds. You get improved blending experience with the 6-cup dishwasher safe glass BPA-free cups that also make pouring easy. It also comes with 24 oz. cup to blend and go with no cleanup. Assembled in North America and contains metallic components that make this unit durable and long-lasting, it can be seen how they brave enough to give 3-Year satisfaction guarantee and 10-year for All-Metal Drive Limited Warranty for lasting durability for this relatively cheap blender. Nevertheless, its versatility, stylish and high performance makes it an ideal choice for you. 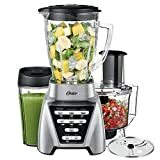 The Oster Pro 1200 also can be declared as the best blender under $100 which provide motor above 1000 watt that I believe it will be a great acquisition to have in your kitchen. 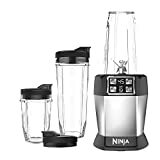 Manufactured by SharkNinja, Ninja Professional Blender (BL610) is also one of the best blenders to consider having in your kitchen when operating within a tight budget. It is popular among many people today especially because of its sleek design and outstanding performance powered by 1000 watt motor, three-speed control, and a pulse option. You wouldn’t be worried of the types of ingredients to use in this blender because it is fitted with six-blade Total crushing technology which delivers unbeatable professional power with blades that pulverize and crush through ice, hard fruits, and other food ingredients within seconds. This blender is enough to enable you to prepare smoothies for the whole family. It has a BPA-free 72-ounce container capacity (about 9-cups), and all its other parts are dishwasher safe. you also get a handy instructional book and an inspirational book to help you kick-start your blending experience and understand the best recipes it works best with. What about the price? Amazingly, Ninja Pro BL610 is very affordable and goes for not more than $100, but its overall performance is way beyond its price. It would be an ideal choice for your kitchen if you cannot afford other high-end blenders like the Vitamix and Blendtec. Having 1000 watt blender motor with less than $100 is luxury thing. Generous 72-ounce pitcher, 1000-watts professional grade motor for heavy duty blending and processing, Pitcher, lid and blades are dishwasher safe, Ninja 6-blade technology, Ultimate ice crushing action - blasts solid ice cubes into powdery snow in seconds. Nutri Ninja Auto iQ (BL482) is one of the best blenders that come with a sturdy and food ingredients extraction performance to extract the possibly hidden nutrients from vegetables and fruits. It is also part of the Ninja Kitchen System series manufactured by SharkNinja Company. The customer satisfaction is high if the reviews of this unit are anything to by. It is fitted with a 1000-watt motor, giving it enough power and explaining further why it can break down all the seeds, nuts, vegetables and ice cubes with ease in a very short time. You will be surprised to get smooth and finer smoothies within a short time by using this unit and wonder if a 1000-watt motor can offer that consistency. The Auto-iQ Technology features intelligent programs which combines between unique timed pulsing, blending and pausing patterns, this blender will help you to do all the work for you. It also has the digital countdown timer displays how much time is remaining on the selected Auto-iQ program or counts up to track blending time when using the two manual speed. Enticingly, this blender comes with travel cups and seal lids that allow you to blend your smoothie, separate the cup, put on the lid and move on without necessarily changing or pouring it another different glass. It seems like the motor fitted on this blending machine is too powerful for it. Extensive use might, therefore, loosen the blades and cause leakage due to the resulting motor vibration. This blender principally extracts all the vitamins and nutrients in the vegetables, seeds, and nuts that you are blending thus giving you healthy and an all-inclusive smoothie. It comes with three cups, one 24-ounce cup primarily used for one-time multiple servings, two 18-ounce travel cups that have lids, and two extracting blades. Nutribullet is gradually becoming a force to reckon in the blender industry. This is part of the Pro 900 is part of the series that has established itself in the market and competing with the highly regarded blenders. This Pro 900 series is arguably the most famous blender of all the Nutribullet models. With over 5,000 reviews and an average rating of 4.5 stars on Amazon, you only get a clear picture of what it can really do to your food ingredient when blending. It is compact and relatively light in weight (11.4 pounds), which makes it portable and easy to store when you are not necessarily using it. Its size should never deceive one, and it is powered by a 900-watt motor which helps you in making your smoothie in no time. It is very powerful like any other big blenders and crushes frozen food ingredients at high speeds (2500 RPM). Another essential thing about this unit is its ease of use and high speed of cleaning. It comes with 15 pieces attachments including 4 cups of a 32-ounce, two 24-ounce, and one 18-ounce capacity. Inside the box, you get a user manual and cookbook, a recipe book and one pocket nutritionist to help and guide you during blending processes. 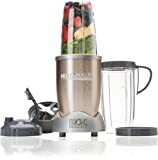 That notwithstanding, for a price range of between $75- $99, depending on where you buy it from, its quality and performance are comparable to some highly regarded blender models. It is one of the best budget blenders that you might consider having in your kitchen. Have a good 900 watt blender motor. KitchenAid gives another excellent option for those looking for budget blenders. Its 5-speed classic model comes in varied colors making it easy for you to choose one they prefer. It is fitted with around 600-watt motor and BPA-free shatter resistant and dishwater-safe 60-ounce jar. It also offers 5-blending speeds that include a great ice crush setting as well as the pulse mode. Manufactured from a heavy-duty metal base for sturdiness and stainless steel blades that enables it to power through hard ingredients with ease. You will not be worried of fineness of the ingredients you are blending because its diamond blending system design allows it blend all ingredients faster and efficiently. It is fixed with a soft start feature and a clean touch control panel that has white LED lights. You can never go wrong with this particular blender. As robust and steady as it looks, it offers high durability and performance just like any other great and powerful blenders that you might find. This machine can work for itself where you no longer need to keep on monitoring it so much time as you have selected the right setting and you will rest assured that the outcome will always be what you desired. With the assistance of Intelli-Speed control, you are confident of getting soft smoothies from this blending machine since it gives it the ability to maintain power speed that ultimately helps in powering through all the ingredients. Watts motor is the first indication whether a blender is a good or not, try to avoid blender which has power wattage less than 500 watts. Beside that you want to make sure the material used to build the blender are good, avoid all plasticky materials. And last the longer warranty they provide the good indication how you should expect for the sturdiness of the blender you are going to buy. Andrew is a blending enthusiast for over 5 years. Recently he manages BlenderVersus.com to provide a well-researched, unbiased and accurate alternative resource platform for all aspects to do with blending and juicing. BlenderVersus.com is a participant in the Amazon Services LLC Associates Program, and we earn a commision of purchases made through the Amazon.com link on our website. Vitamix A2300 vs A2500 – Which is Better Ascent Series for You?